I couldn’t help myself. I stopped in at the farmer’s market to pick up some flowers and saw the strawberries. The gallon tub of strawberries looked and smelled delicious. So, I added it to my order and decided we’re having strawberry shortcake tonight. I loved strawberries and strawberry shortcake as a child. Everything about it. The smell, the taste, the signals it triggers in my brain that summer has arrived. I loved it so much that I became infatuated with the character. I wanted to be her. Surrounded by strawberries all day, eating sweets. What’s not to like about that? “One man I should not have killed and one I should have.” One of the Rossingol sisters ruminates on this as she makes her first trip back to Paris as a now elderly woman. Which sister says this is a mystery until the end of the book. 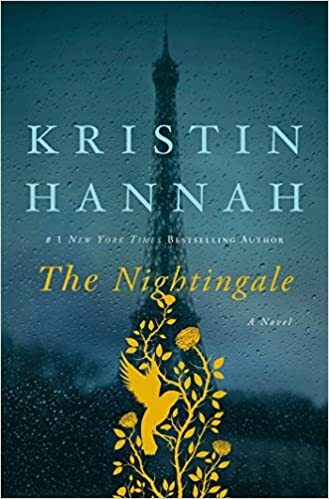 The Nightingale is the story of two sisters whose lives were shaped by tragedy and remolded by crisis. Who is the Nightingale? It seems obvious as you read the story, but by the end you wonder. This was a Sunday morning experiment. I had a Pillsbury croissant package in my refrigerator and I wanted to do something unexpected that would get everyone moving and still be a treat. I spread the dough out on a cookie sheet, tore the dough along the perforations to form triangles. I then added a spoonful of Nutella at the fat end of each triangle. Rolled the dough up and made sure they were properly spaced on the cookie sheet. I then followed package directions on the back of the dough tube for length and temperature of heating, well sort of, I left mine in a wee bit too long but as they were rescued before they burned — voila – Chocolate croissants! I am sure there are many way to make this even more fancy and the chocolate even gooier, but this was so easy and so so yummy! They sliced easily with a fork, as you can see above, and I made one note to myself – next time I am going to add a larger spoonful of Nutella. However much it will hold without squirting out the sides. The main thing is to be able to seal the chocolate in the dough. I did not have to look to know what they were seeing, I knew. I have played the same game with both of my children when they were younger. These two were cloud gazing – watching the pictures form in the sky and making up little stories to go with it. Walking a few more paces the cloud watchers were soon behind me and not able to see me snap the picture (below). I do sort of see the turtle and the dog, but I see other things in these shapes. Studying the image a second cloud also looks like a turtle, but maybe that is just the power of suggestion. Of course my vantage point was not nearly as good as theirs and by the time I snapped the picture the clouds had begun to reshape into other things.